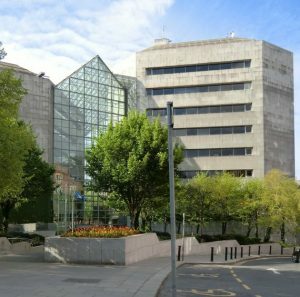 Initial Situation: Two new high efficiency condensing boilers fitted into the basement of a nine-story office block (Dublin Civic Offices, Ireland) using two separate brick lined chimneys that rose through the nine floors and exited on the rooftop. Project challenge: The brick chimneys posed a problem for the project manager as the chambers measured 300mm x 450mm, no standard flue would fit as the flue required had to be 350mm in diameter, due to the pliability of Furnflex25 the liner was able to take an oval shape in the chamber giving it the full 350mm required. An additional challenge was the fact that this was an extremely busy high-profile office block therefore minimum disruption to day to day business was a prerequisite. Result: Following an onsite survey, Furanflex25 was deemed the ideal solution to line both chimneys. The installations were carried out over two weekends, one for each chimney, with no disruption to the business, project completed on time and within budget. Completed by: Action Chimneys Ltd. Co. Kildare, Ireland.